If you borrowed against the equity in your home, chances are your mortgage contains one or more errors. The Lane Law Firm can help you determine what violations you have and how to fix them - just as we've done for more than a thousand clients since 2009. Most Home Equity Loans Contain Errors; Does Yours? Texas has traditionally had very strong state laws to protect homeowners. In fact, the state didn't even allow homeowners to borrow against the equity in their homes through Home Equity or HELOC (Home Equity Line of Credit) Loans until 1998. Since then, hundreds of thousands of Texans have borrowed against the equity in their homes to finance home improvements, consolidate debt, pay for college, or whatever else they wanted to do with the proceeds. They did so with the assurance that they were protected by the most homeowner-friendly protections in the nation. But since then, banks have lobbied hard to water down those protections with various amendments that benefit themselves over homeowners. Read about how Home Equity borrowing in Texas forever changed on January 1, 2018. Surprisingly, most Home Equity Loans prior to 2018 do not comply with the strict consumer protections that were initially written into the Texas Constitution. In fact, since 2010 we've examined thousands of loans (at no cost to our clients) and discovered that about 87% of them contain one or more violations! When violations are brought to the attention of the bank, the law requires they "cure" or fix all violations. Legally, they are given fair opportunity to "make things right" with minimal consequence to them. Sometimes they do the right thing and make the borrower whole, but often times they refuse to do so - ignoring their legal obligation. In these instances, you, as the borrower, may be entitled to cash compensation and/or your lender may be required to return all your payments and void your lien so that you own your home without owing anything on your mortgage! Even if you took out the loan several years ago, you still have time to examine your loan documents to see if you too are the victim of fraud, predatory lending, or illegal loan practices that are common with these loans. If you aren't sure if your loan contains errors, take advantage of the resources on this page to discover for yourself if your loan is one of the 87% that contains errors. If you have questions, call our friendly staff at 713-590-3066 for a no cost or obligation consultation, or click here to schedule a meeting with us at your convenience. We're happy to perform a comprehensive audit of your loan documents without cost or obligation, so what do you have to lose? We are pleased to assist clients with select services on a contingent fee basis, meaning that if the firm does not obtain a recovery, or if the amount recovered does not exceed the amount of costs and expenses, then the firm is not entitled to any fees. ZERO out-of-pocket cost to you means ZERO risk. Contact us for more details. The [Home Equity Loan] audit is designed to identify whether or not mistakes have been made by your lender. That could be charging more than they're allowed to originate the loan, it could be lending more to you than they're allowed to given the value of your home, it could be failing to provide you with documents. If you aren't sure whether your Home Equity Loan contains errors, read our 5 Step Guide to Determine if Your Loan is Illegal below. The guide is designed for Home Equity Loans that originated prior to 2018. It will show you step-by-step how to examine your documents to determine whether your loan has errors. Plus, if your loan does contain errors, it will show you how to demand the bank fix the errors - without an attorney! In a hurry, or just want to take the guide with you? Click here to download it now. The first step in determining if you were the victim of an illegal loan is to locate your loan documents. What you are looking for is the set of documents that you received upon signing for your loan. 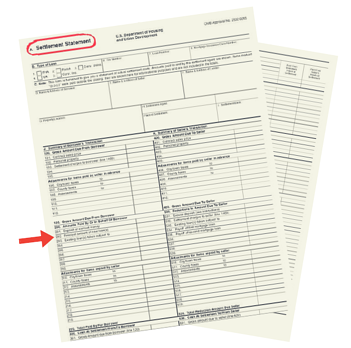 The document set may be in a folder or envelope with a title company's logo on it. The document set includes a Settlement Statement, a Texas Home Equity Note, a General Warranty Deed, a Texas Home Equity Security Instrument or Deed of Trust, an Acknowledgment as to Fair Market Value of Homestead Property, and other miscellaneous documents. If you've refinanced you loan, then find the documents associated with the most recent loan. If you are unable to locate your loan documents, contact the title company who processed your closing and they should be able to provide copies at no cost to you. If you didn't receive copies, that is a violation. If you did not go through a title company, you likely have an illegal loan! Now that you've found your loan documents, look for your Settlement Statement. It is a standard form used to itemize actual settlement costs. The words "Settlement Statement" will appear at the top of the document that looks like a chart with four columns. It is typically on legal-sized paper and looks similar to the image below. First: Find the Principal Amount of New Loan(s) on line 202. Multiply the amount that appears in line 202 by 3%. (For example, if the Principal Amount of New Loan(s) is $100,000, 3% of $100,000 = $3,000). This is the maximum amount you can be charged in fees. Then: Add up any and all fees paid by adding all the figures in the Borrower’s (left) column on Page 2 of the Settlement Statement. Not sure about which fees are counted and which aren’t? Call the experts at The Lane Law Firm at 877-408-3328 – they’ll guide you through the calculations, or examine your documents for violations for you at no cost, and without any obligation. Finally: If the total of fees are greater than 3% of the loan, you likely were charged too much in fees, making your loan illegal. Skip to Step 5 to see how to fix the problem, or continue on to Step 3 to see if your loan has additional violations. The Acknowledgement of Fair Market Value is a required document that provides the fair market value as determined by the lender on the day the loan was given. First: Is the document signed and notarized by all parties, including the lender? If not, your loan is likely illegal. Skip to Step 5 or continue looking for violations. Then: Find the “fair market value” dollar amount on the Acknowledgement of Fair Market Value document. Multiply the amount by 80% to determine the maximum loan amount. (For example, if the Fair Market Value is $100,000, 80% = $80,000). Finally: Find the Principal Amount of New Loan(s) on line 202 of the Settlement Statement (from Step 2). Add this to the balance of all other loans attached to the home (if any). Referring to our previous example, if the sum is greater than the Fair Market Value which was $80,000 in this case, you likely were loaned too much, which would make your loan illegal. Skip to Step 5 or continue looking for more violations. Not sure about what the fair market value is? Call the experts at The Lane Law Firm at 877-408-3328 or click here to schedule an appointment – they’ll guide you through the calculations, or examine your documents for violations for you at no cost, and without any obligation. 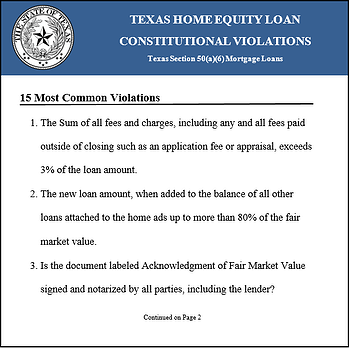 In addition to the common violations in Steps 2 & 3, the Texas Constitution provides many additional requirements that lenders must adhere to. But so often in their haste and greed to lend money, they fail to follow the legal requirements. Did the loan close anywhere other than the lender’s office, a title company, or in an attorney’s office? Did the loan close within one day from receiving a final itemized disclosure of all fees and points of interest costs and charges or did you see the final documents for the first time at closing? Not sure if you have any violations? Call the experts at The Lane Law Firm at 877-408-3328 or click here to schedule an appointment – they’ll examine your documents for violations for you at no cost, and without any obligation. So you’ve determined that you likely have an illegal loan. In order to have the violations corrected, you must notify the bank by sending a Demand Letter requiring that they correct the error(s). The bank then has 60 days to “cure” the violations by paying you a fine of $1,000 and correcting the exact violation(s) by refunding money and/or re-closing the loan. Then: If the bank ignores your Demand Letter or claims they didn’t do anything wrong, you must file a lawsuit to enforce your rights. You can do this pro se, meaning you represent yourself, or you can hire a lawyer to draft the petition and negotiate on your behalf. You should only consider lawyers with expertise in Home Equity Loans and who have experience in litigating (and winning) hundreds of similar cases in Texas. Check with the State Bar of Texas and on-line attorney rating services such as Avvo. The Lane Law Firm specializes in Home Equity lawsuits and can represent you and your Home Equity violation case completely on contingency in most cases. To schedule your no cost, no obligation appointment, click here or call 713-590-3066. We typically represent clients with home equity loans that are not in default on a contingent basis. That means there are no out-of-pocket costs to you for our representation. We only get paid if we recover money for you, so you have nothing to lose and so much to gain. Want to Take the "5 Step Guide" with You? You've read the guide, now take the test to see if you are one of the 87% who got ripped off! These remedies may only be available if you act within four years. To determine if you have an illegal loan, take the FREE Home Equity Test today. If the mortgage company refuses to correct the violations, you are entitled to what some of our clients have already won - a FREE HOUSE. Time may be running out on your opportunity to correct violations so don't delay, take the test today! On November 7, 2017 Texans passed Texas Proposition 2, also known as SJR 60 or the Home Equity Loan Amendment (2017). It made changes to Section 50(a) of Article 16 of the Texas Constitution, and became effective January 1, 2018. Lowering the limitation of fees that can be charged to the borrower from 3% to 2% and removing certain fees from this calculation. Expanding the list of lenders authorized to make Texas home equity loans. Allowing Texas home equity loans to be refinanced as rate-and-term refinances. Repealing the prohibition on originating a Texas home equity loan secured by a homestead property with an agricultural tax exemption. Eliminating the 50% threshold for advances on a home equity line of credit (“HELOC”). Home equity loans that originate after January 1st of 2018 will be impacted, as well as loans made prior to the change that are refinanced after January 1st. For more information on the impact of the change, read How Home Equity Borrowing in Texas has Forever Changed. Below are answers to the most common questions we hear from clients. If there is a question you have that we didn't cover, give us a call at 877-408-3328. Q. If I file a claim, will my mortgage company get mad at me and change my mortgage terms? No! Your mortgage company is bound to the terms of your contract regardless of your attempts to keep them from taking advantage of you. It would be illegal for them to change your terms or otherwise “punish” you. Q. How does making a claim with my mortgage company benefit me? If the mortgage company violated your constitutional rights in the origination of your loan, they must fix the violations or the lien is wiped out and they are required to refund to you all payments made on the loan - principal AND interest. Q. Can I make a claim even if I am current on my mortgage? Absolutely! Just because you’ve done your part and paid your mortgage on time doesn’t mean the bank has the right to take advantage of you. Q. Can I make a claim if I am behind on my mortgage? Yes, but the process is different. If you are in default on your mortgage, we offer Foreclosure Relief Services that can halt the foreclosure process while we negotiate your desired resolution through a Loan Modification, Short Sale, or other loss mitigation alternative. Q. How does The Lane Law Firm get paid? Most of our compensation is earned thorough a contingency, which is a portion of the money received thorough any settlement. There are no “out of pocket” fees required of our clients. If we don’t win, we don’t get paid, so there truly is no risk to you to make a claim! Q. Will making a claim effect my credit score? No, making a claim will NOT affect your credit score. Q. How long will the entire process of making a claim take? By law, the mortgage company is given only 60 days to fix violations. If they ignore or choose not to fix them, additional legal proceedings will be necessary, and those can take several months to a year or longer. Q. Will I be able to get another mortgage in the future if I win and get my mortgage voided? Yes, accepting a settlement should not affect your ability to obtain a new mortgage in the future; especially since most settlements contain a confidentiality clause protecting you. Q. How much money could I receive from a settlement with my mortgage company? It depends on the value of your house and the total amount of payments you’ve made. If your lien is voided, you will not owe the remaining balance and you may receive all your payments back. Q. 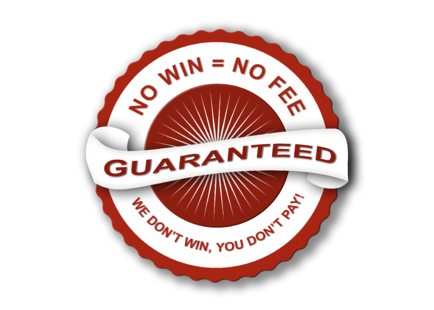 Does The Lane Law Firm offer any guarantee? Lawyers are prohibited from making guarantees when litigation is involved. Like all legal cases, the outcome depends on the merits of the case as well as the opinion of the court. So, while we can pledge to give your case our best effort, we can’t guarantee a specific outcome. Q. Has The Lane Law Firm been successful in settling predatory lending cases? Yes, absolutely. The Lane Law Firm has negotiated successful outcomes for hundreds of clients with similar cases. Some clients have even received "free houses." Remember that each case has a unique set of facts, circumstances, and parties involved which affect the outcome. Q. How do I know if my loan contains violations? Use our 5 Step Guide to Determine if Your Loan is Illegal, or simply provide us your loan documents and we will perform a comprehensive audit at no cost and without obligation. Q. How long do I have to make a claim for violations in my loan? In 2016 The Lane Law Firm was successful in getting the Texas Supreme Court to acknowledge that there is no statute of limitations to make claims, so they can be made at any time. However, if you do not make a claim within four years of origination, the amount you are able to collect may be limited, so it is important to act quickly before it is too late. Q. Do I have to continue making payments on my mortgage while The Lane Law Firm is disputing errors? We recommend you continue to make your regular monthly mortgage payments. Q. What if I do an audit and there are no violations found? Congratulations, you are among the less than 13% of borrowers who have a loan with no violations! You’ll have the peace of mind knowing you weren’t taken advantage of. Q. What does it cost for The Lane Law Firm to audit my loan documents? Nothing. You will be provided our findings along with our recommendations at no cost, and without any obligation. Q. I reviewed my loan documents and found one or more violations. What do I do next? Call The Lane Law Firm today at 713-590-3066 (or toll-free at 877-408-3328) to arrange for a free audit of your documents. We’ll confirm the violations and seek a cure and payment for the violations. Q. Can I make a claim to the mortgage company myself? Absolutely. 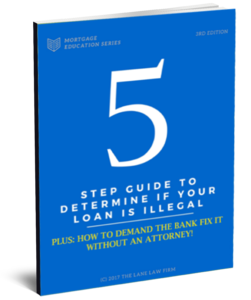 We recommend you read the 5 Step Guide to Determine if Your Loan is Illegal which contains instructions on how to demand the bank fix violations without an attorney. Q. How long does it take for The Lane Law Firm to audit my loan documents? Audits are typically completed in 2-3 business days. Q. What if I refinanced since I took out the home equity loan? Only the most recent loan should be examined for violations. If your loan was refinanced prior to January 2018, it is still a home equity loan – even if no additional cash was taken out. If refinanced after January 2018, you might have chosen to re-characterize the loan as a rate-and-term refinance, in which case you’ve lost all the constitutional protections that come with a home equity loan. Q. I have a reverse mortgage, is that a home equity loan? Reverse mortgages, home equity lines of credit (HELOC), and cash out refinances are all types of home equity loans. Have a question we didn’t answer? Give us a call at 877-408-3328, or click here to schedule a free consultation.